Residents of Brooklyn, Curtis Bay and Cherry Hill have long complained that they suffer among the worst health effects from Baltimore’s dirty air. The rate of acute asthma incidents they suffered decreased as well. The new study also documents stark differences in asthma hospitalization rates between the city’s lowest income zip codes and its wealthier neighborhoods, such as Roland Park and Mount Washington. Toughening up state and federal pollution controls could improve health across the city, according to “Asthma and Air Pollution in Baltimore City” released today. A core finding was that the asthma hospitalization rate in two South Baltimore zip codes (21225 and 21226) fell dramatically after a pair of nearby coal-fired power plants installed air pollution control devices. The rates dropped 57% between 2009 and 2013 – more than twice the citywide average – after a state law required the Brandon Shores and Wagner power plants to install new pollution control devices in 2009. “This encouraging decline in asthma hospitalizations shows that – although asthma is a very complex and difficult problem – we don’t have to throw up our hands and say that there’s nothing we can do,” said EIP staff attorney Leah Kelly. While the rates came down, Kelly and her co-authors said, they are still unacceptably high. The report showed that Baltimore has the highest rate of acute asthma events in Maryland – with hospitalizations more than twice the state average and almost three times the national average. In the city’s lowest-income areas, the rates were higher still, according to the study, which used newly available data that permitted zip code level analysis. 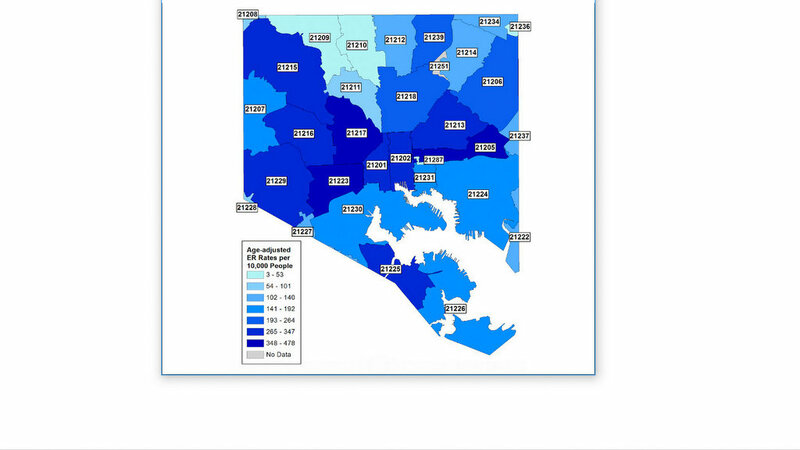 Disparities by race and income in Baltimore were also the subject of a recent report by Kaiser Health News and the Capital News Service. The reporters focused on the 21223 zip code where paramedic crews make more asthma-related visits per capita than anywhere else in the city. In this part of southwest Baltimore, which includes Harlem Park, Poppleton, Carroll Park and Shipley Hill, there are few doctors treating asthma, but plenty of the decrepit houses, rodents and bugs that trigger it, reporter Jay Hancock and his co-authors found. Topping the Environmental Integrity Project’s list of recommendations is for the state government to crack down on polluters. “One step we should take is to require, for the good of public health, that all major air pollution sources – such as incinerators, power plants and vehicles – have state-of-the-art pollution control systems,” said Kelly. The findings come as her group and other environmental advocacy organizations are pushing for stricter emissions limits for municipal power plants – specifically the Wheelabrator trash incinerator that, as The Brew reported a year ago, is the biggest sources of air pollution in Baltimore. 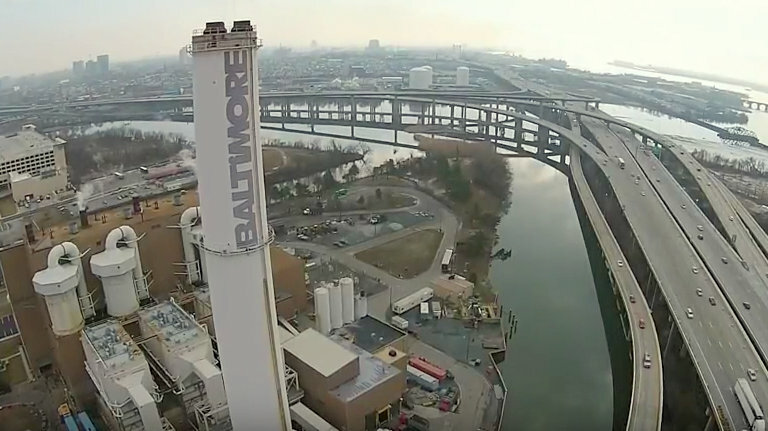 Pushed by environmentalists, the City Council is calling for the incinerator, known as BRESCO, to meet pollution control limits that are stricter than those being proposed by the Maryland Department of the Environment (MDE). “The city has changed in many ways and one of the ways is, we can’t live with this environment and atmosphere anymore,” Councilwoman Mary Clarke told a Wheelbrator representative at a September hearing. Other recommendations in the EIP report include reducing pollution by improving public transit (such as reconsidering the building of the Red Line vetoed in 2015 by Maryland Gov. Larry Hogan) and having local officials and universities give residents greater access to community-specific air quality and asthma data. 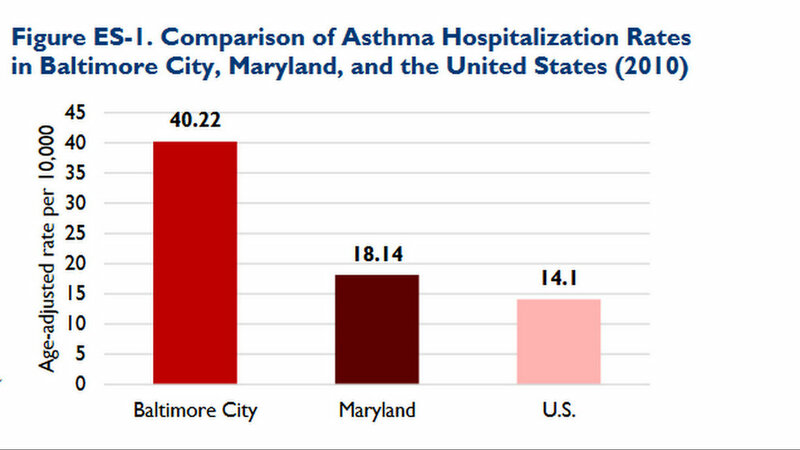 Asthma-related hospital discharge rates were lowest in Roland Park (21210) and Mount Washington-Pikesville (21209). They were highest in East Baltimore (21205), lower Belair and Harford roads (21213), Midtown-East Baltimore (21202), and southwest Baltimore (21223), the EIP report found. 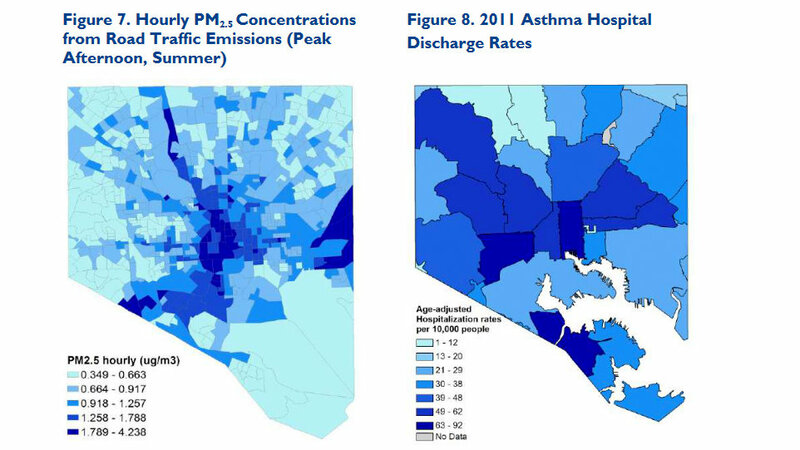 The 64-page study assesses the impact of two factors – air pollution and poverty – on acute asthma events in Baltimore. The authors note that the report does not attempt to identify and assess every condition that contributes to these events. “Asthma hospitalization rates are impacted by a multitude of factors, including health insurance and the availability of asthma inhalers; poor housing conditions, including mold, mice and cockroaches; emotional stress; and indoor and outdoor air pollution, all of which can trigger asthma attacks,” the report said. One major finding is that the largest contributor to the air pollution people breathe is on-road vehicles. Using “C-Line,” a tool made available by the University of North Carolina and the EPA, the authors were able to map roadway emissions in Baltimore. The center of the city, which is exposed to pollution from the I-83 expressway in addition to traffic congestion on non-highway roads, had the most area exposed to relatively high pollution levels from roadway emissions. Not surprisingly, other parts of the city with the highest level of auto pollution were along busy interstates, including I-95 and I-895. Bringing down pollution levels from all sources is worth the investment, according to Kira Burkhart, EIP’s senior research analyst and a co-author of the report.